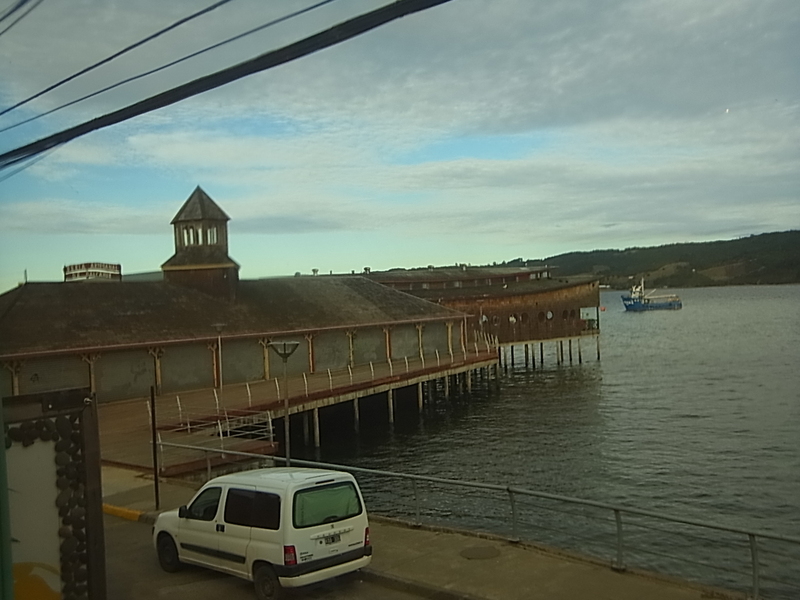 There we are, back in Puerto Montt after our one-week-detour of the island Chiloe. 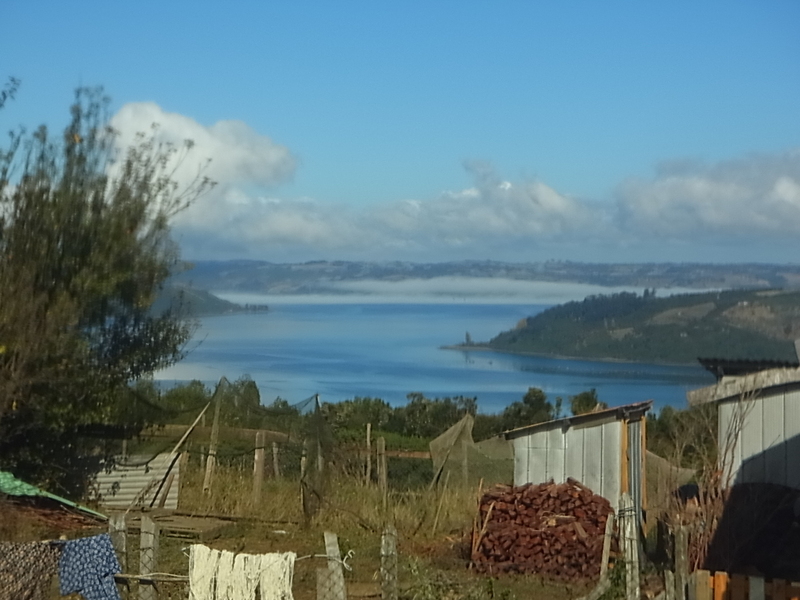 It is the middle of april and the rain season is starting but we were lucky with the weather on Chiloe and decide to try our luck again and continue cycling north through the lake and vulcano region of Chile. 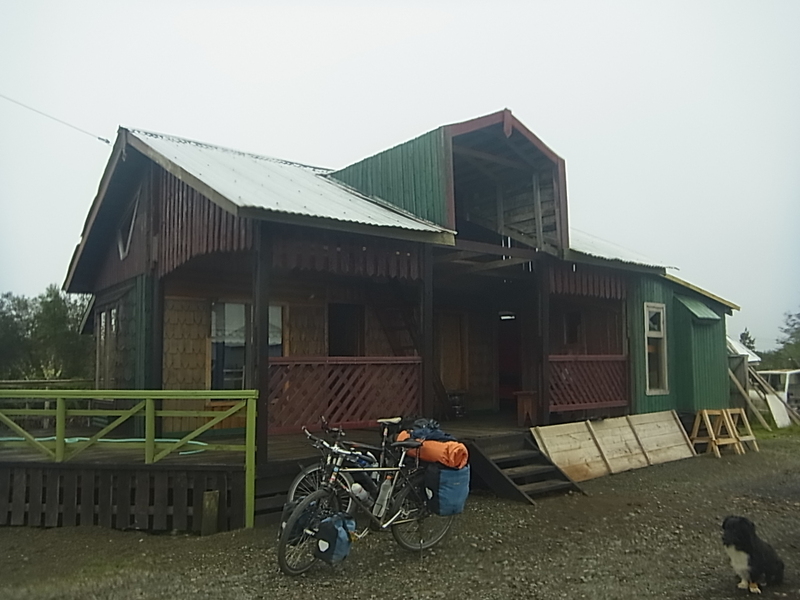 We have already cycled a part of it around Villarica in the North (before we crossed the Paso Huahum to Argentina) and now we are curious to visit the southern part. 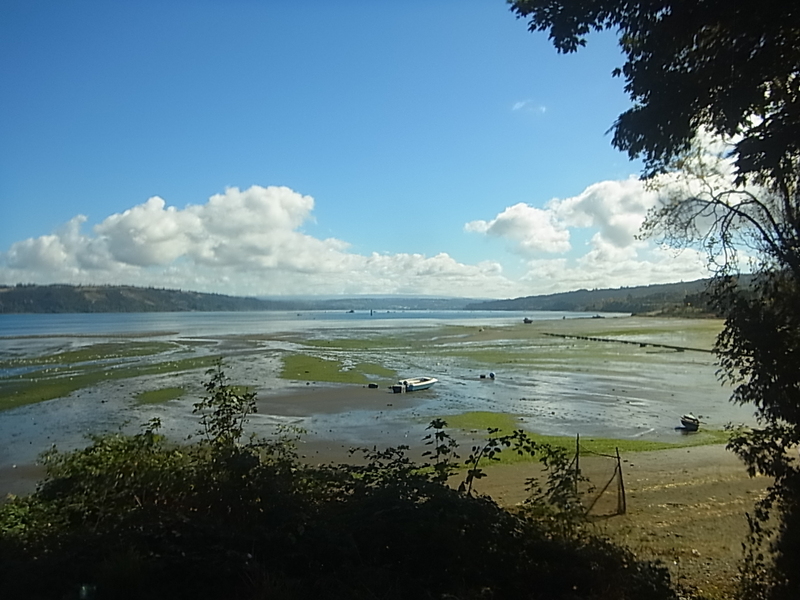 From Puerto Montt itˋs just around 50km to the biggest lake, the Lago LLanquihue and we want to cycle along the western shore of it. Doing so we will pass by several german-founded villages which have the reputation of still being very german. 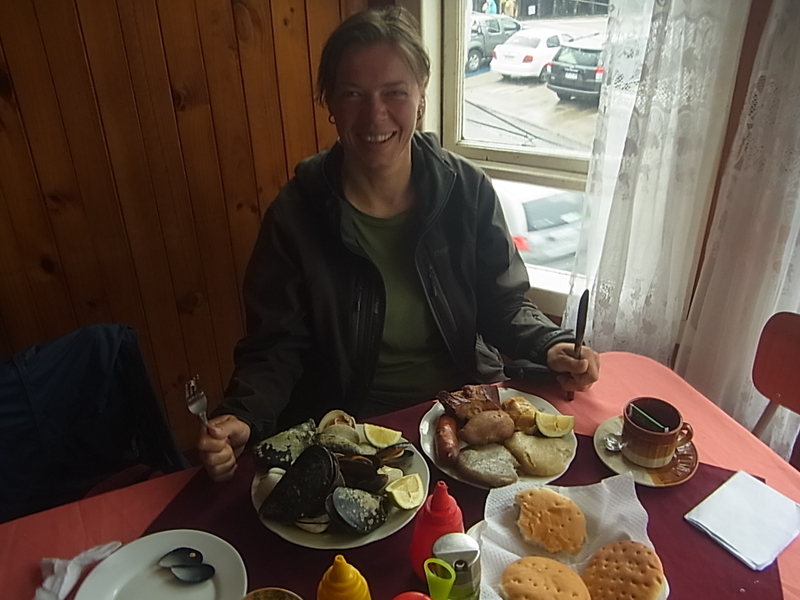 Furthermore, Llanquihue is home of the meat-factory “LLanquihue” which produces all kinds of Wurst, very german and very tasty as well. 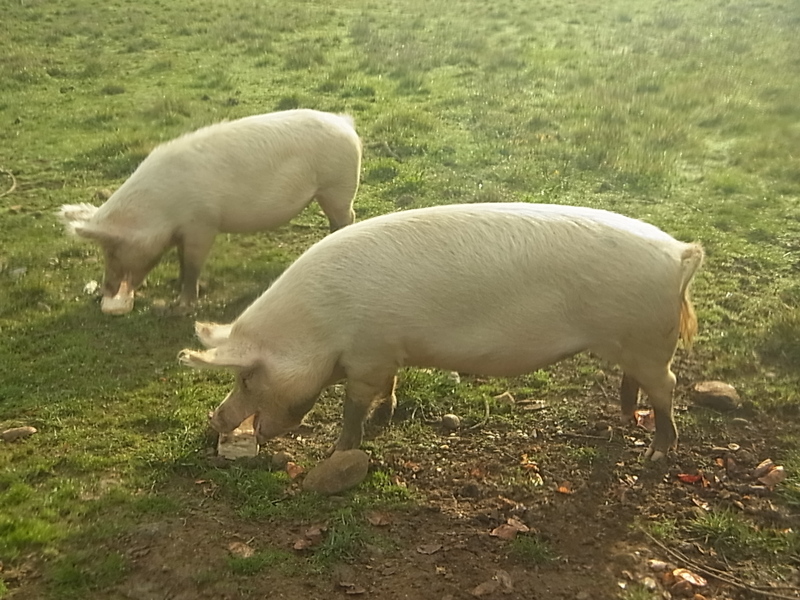 We buy a good stock of Longanizas (sausages) for small money in the outlet-store and cycle on through a marvellous surrounding on quiet roads. 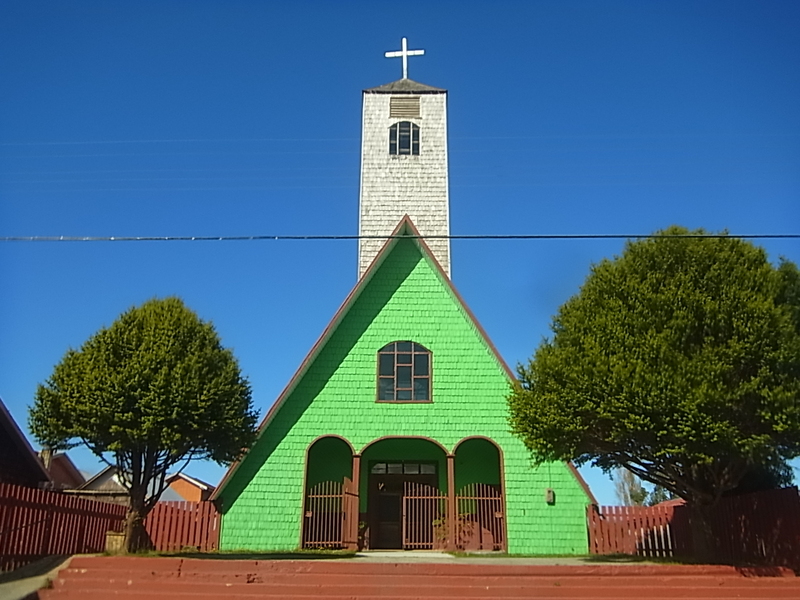 Around noon we come to Frutillar, the most german-like village of all. At least there are some german-style houses, the Bomberos are called “Feuerwehr” and cakes are sold in the “Kuchenladen”. To be fair, there are for sure more german traditions and culture one can discover, but itˋs just not the right time of the year to hang around. Summer is over, the tourists are gone and everybody is preparing for the long and rainy winter. And we are not really in a discovery mood as well. Exhausted after four months of cycling Patagonia we have to admit, that the most important thing now is to get away before the rain starts. 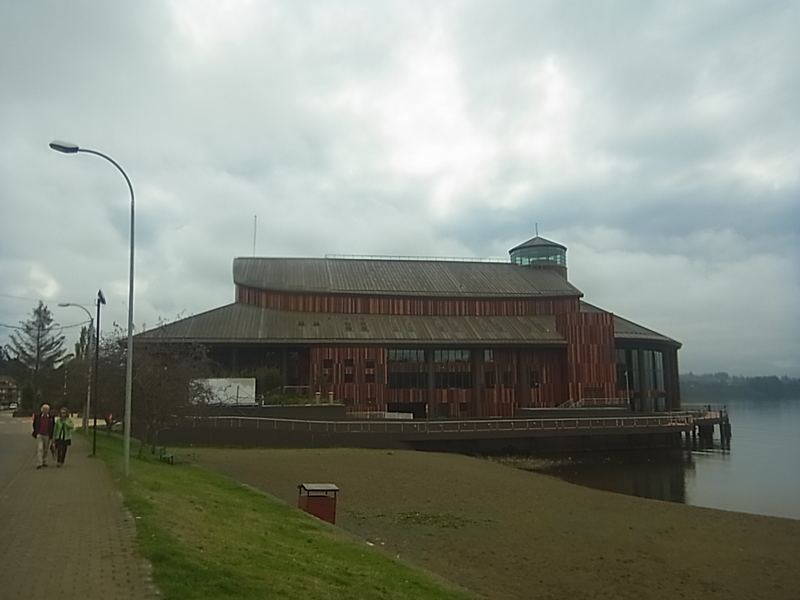 All the time since Puerto Montt there are dark grey clouds hanging over the lake and itˋs a pity. 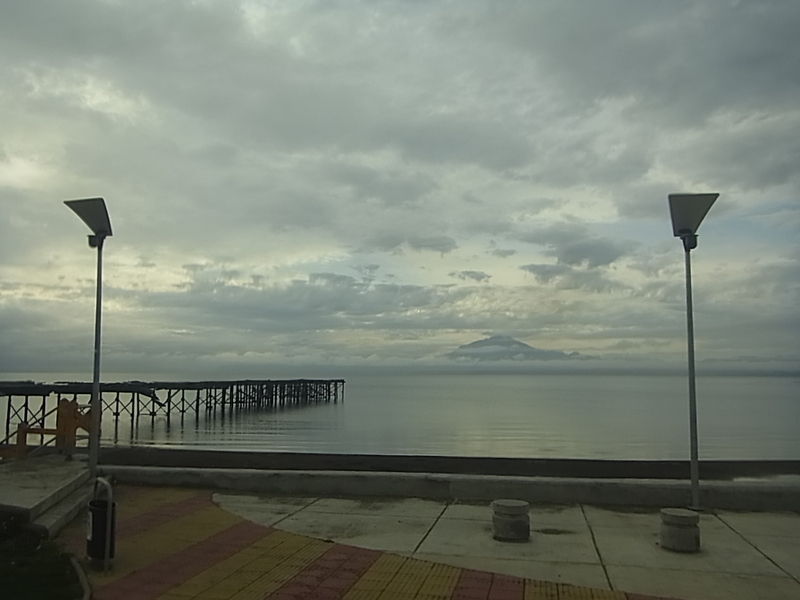 Besides the danger of rain they cover the vulcanos Osorno and Calbuco, two giants with snow-capped tops and still active. For us the final sign to leave the lake region although the next day the sun shines and allows a nice final view of Puerto Octay with the Lago behind. 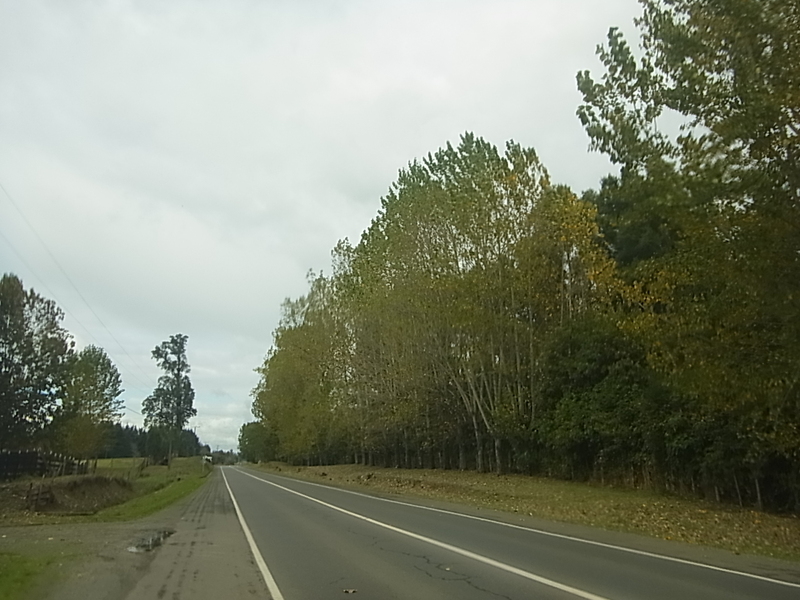 The ride towards Osorno than is rather flat and fast, and on our arrrival we go in search of accomodtion once again. 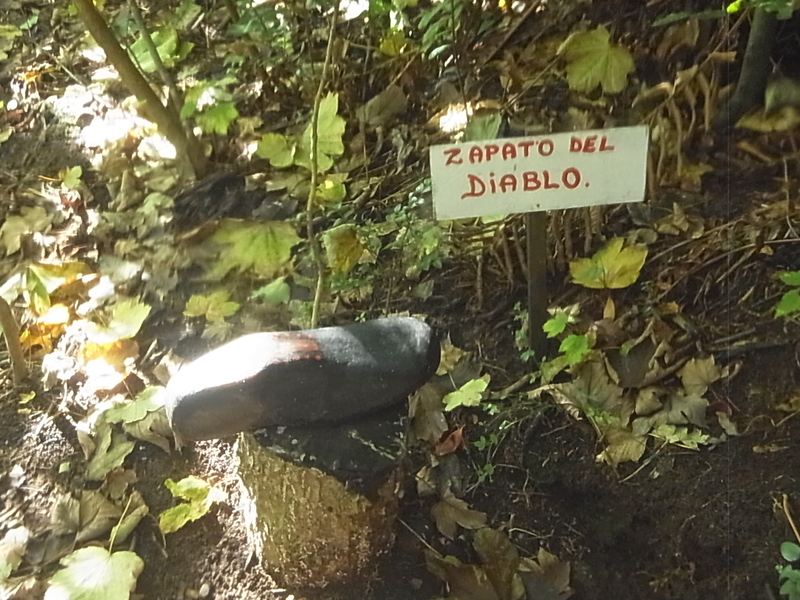 Our first attempt at the Bomberos (Cuerpo aleman – german corps) fails, but at the second station we stumble upon an elderly man – around 70 – and ask him if we can stay there. Three years ago, a fist-size tumor was found and removed at the back of Davids´ head. Doctors gave him a 10% chance of surviving the operation and a zero chance of talking, walking or any kind of independant life afterwards. 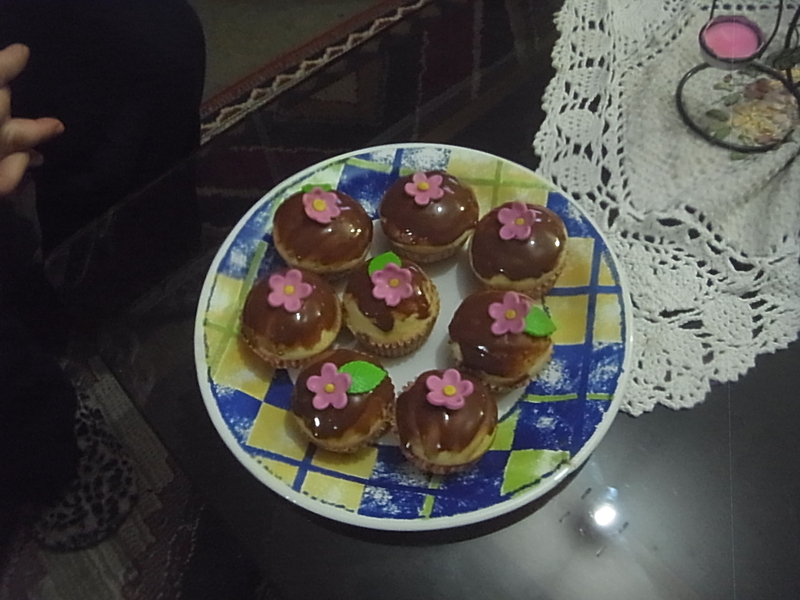 But he and his family didnˋt accept this forecast and now there he is, sitting in front of us and telling his story and all his plans for the future while his mother offers us self-made cup cakes. Some hours in the nightbus from Osorno to Talca, 30km cycling on to San Clemente and then westumble upon Sergio at the Plaza de las Armas. 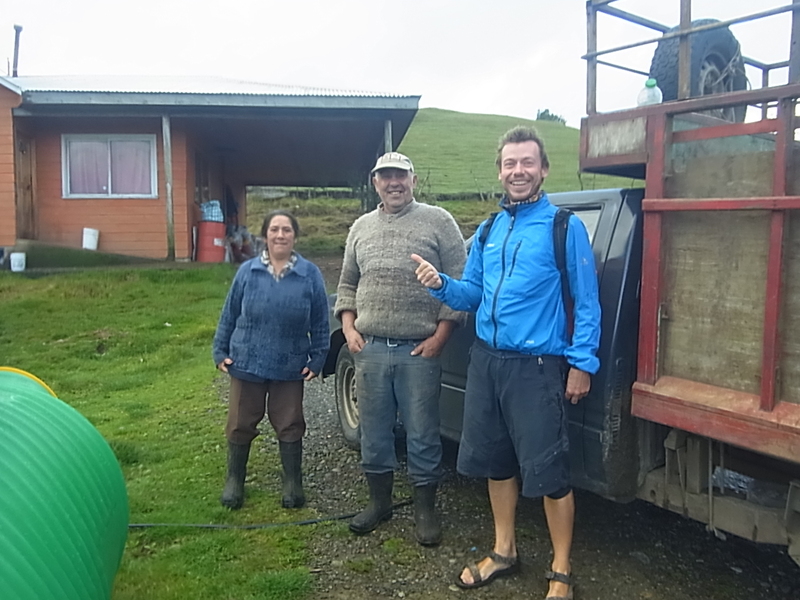 He is happy to see us again and we are happy to be once more on the goat-farm from where we started our Patagonia-tour four months ago. 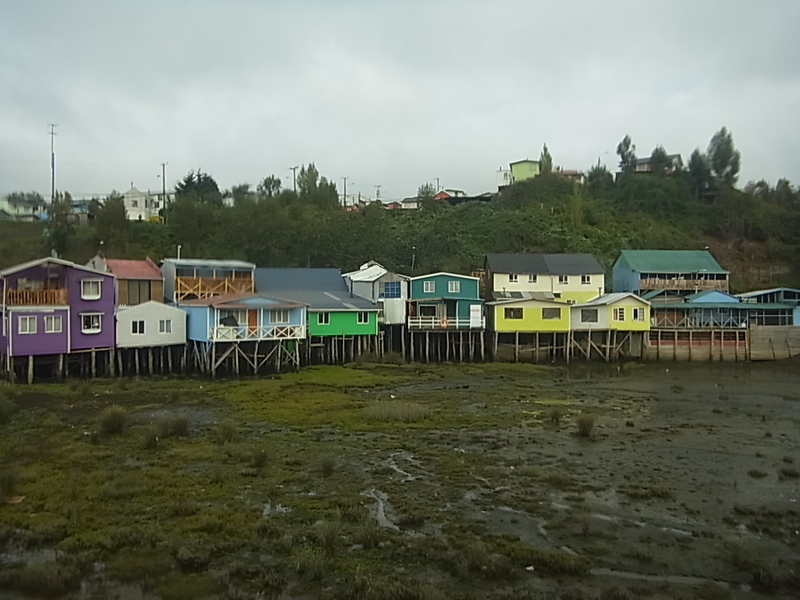 Chiloe: The second-largest island of Chile (behind Tierra del Fuego), divided from the continent by nothing more than a narrow channel of some kilometers but with a rather unique culture and possibly the most rain in South America. 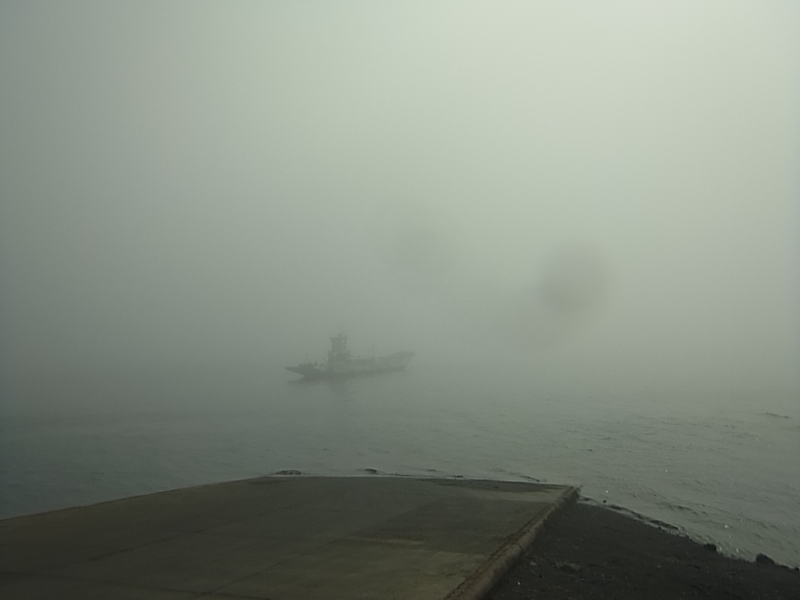 The ferry trip takes around 30minutes and although the day started with heavy rain in Puerto Montt, now the sun is out as we cross over to the island. 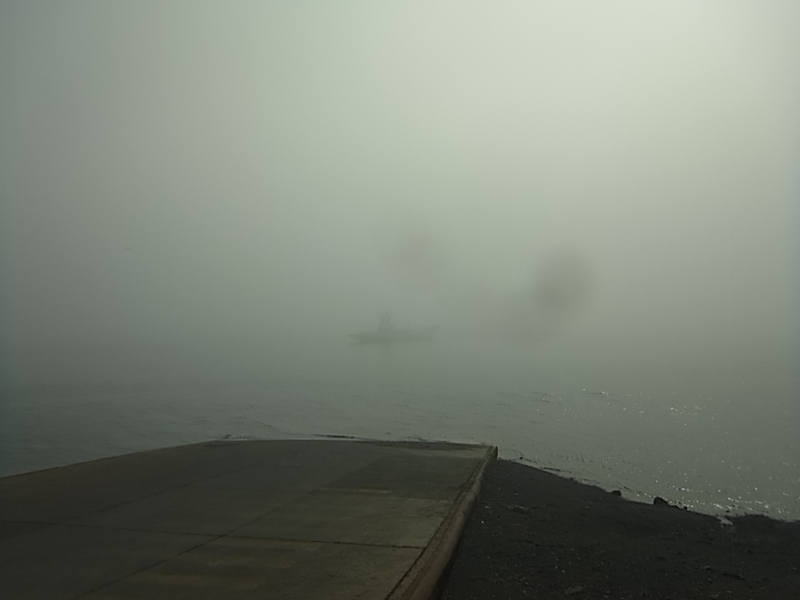 We look out for dolphins but there are just some playfull sea-lions following the ferry, nice anyway. 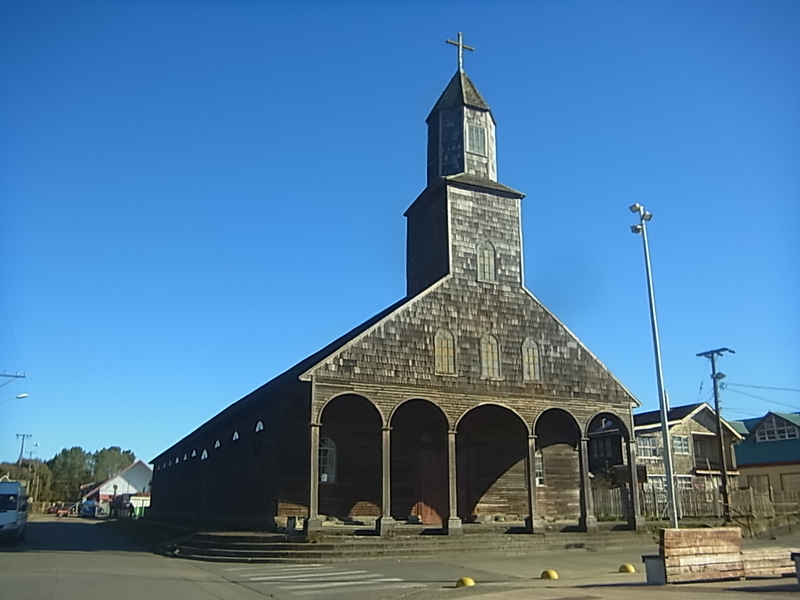 On Chiloe we immediately encounter two of the island specialties: Seafood, sold at the dock, and the white wooden church in the center of the small village Achao where the ferry lands. This one here being the oldest, built in 1740 and still standing!!!! Weˋll get the chance to taste and see more of both soon but first we have to solve a little problem. During the ride from Puerto Montt to the ferry the second connection between the frame and the luggage carrier of my (Katharina) bicycle broke (the first one broke already back in Argentina, one year earlier). 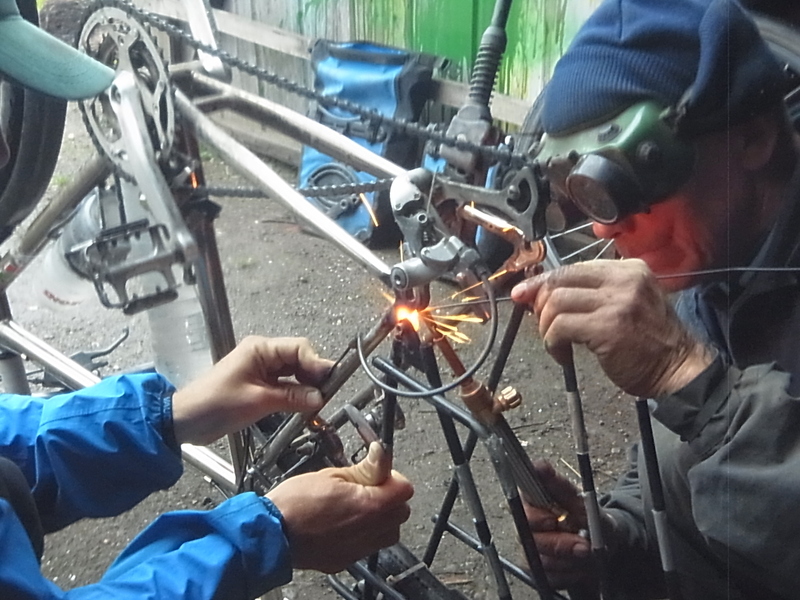 We could fix it with strap-ons but now both sides arenˋt stable anymore and so we have to find a welder as soon as possible. 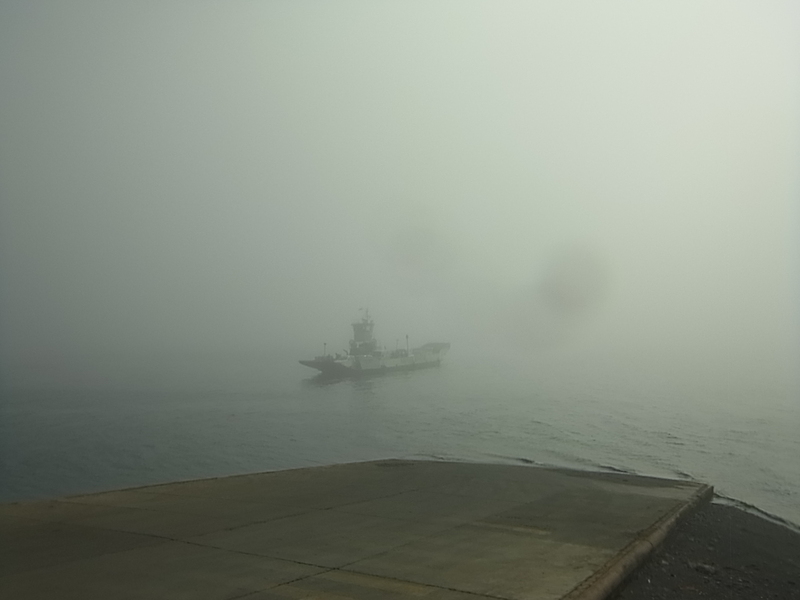 No luck in Achao, the welder there wonˋt be at home until late so we decide to move on and head towards Ancud, the second-largest town of the island. 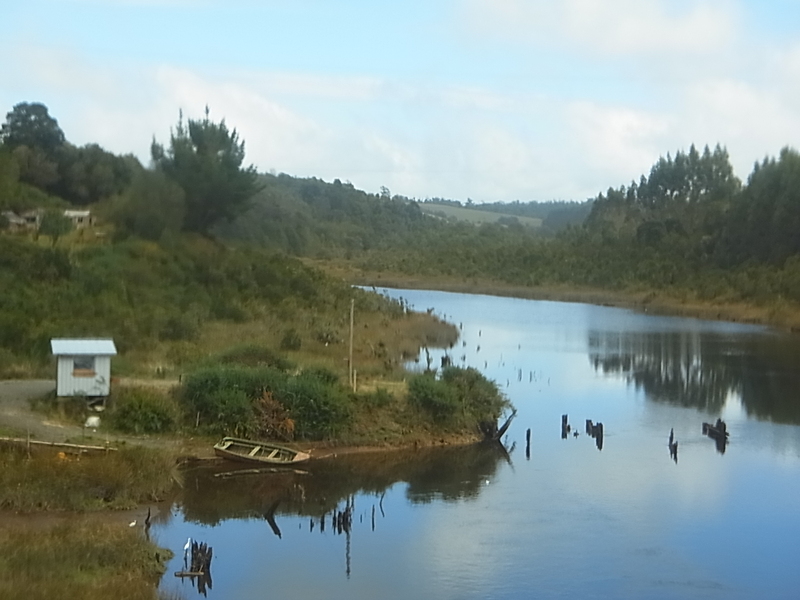 Along the way we stop at a farm and ask if we can pitch our tent, and the friendly couple offers us an unused cabin to spend the night and then even invites us for dinner, so we get to know the third specialty of Chiloe: the warm-hearted people. Still in our own century we cycle on. 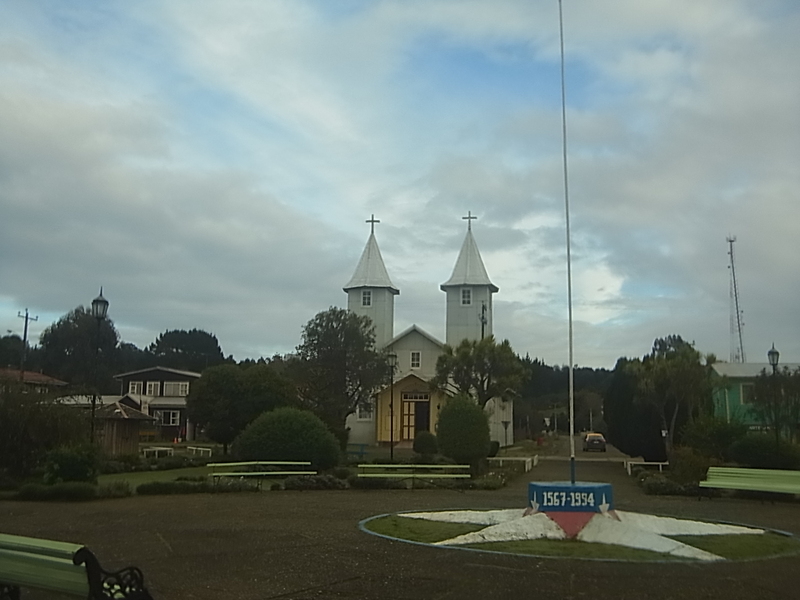 Itˋs raining and itˋs getting worse the closer we come to Ancud where more dark grey clouds from the Pacific are coming towards the island. So we are half disappointed and half glad, when we hear that the Pinguinera we wanted to visit is closed because the Pinguins already left. 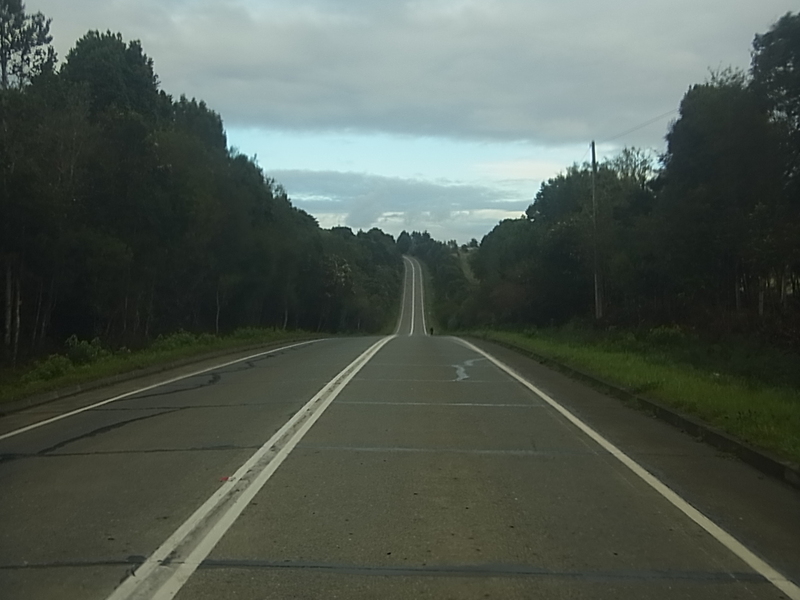 That “saves” us a detour of 60km to the coast. 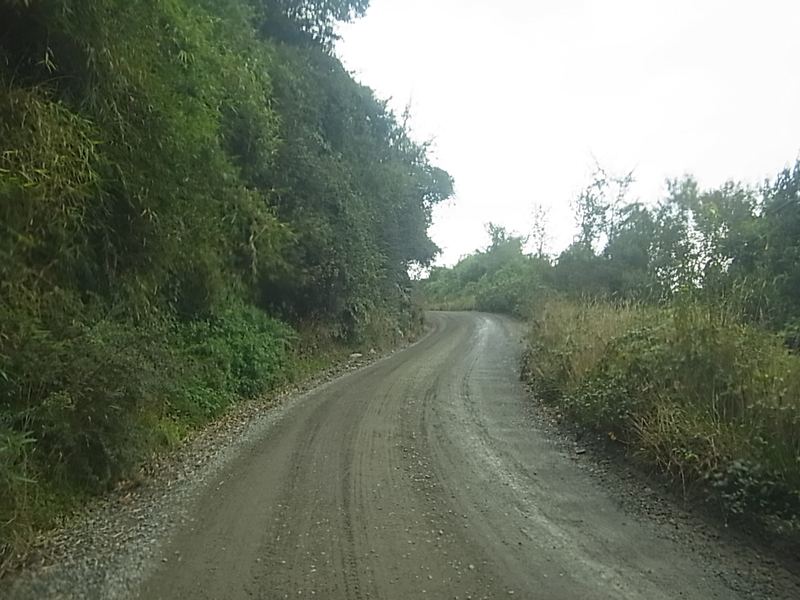 Instead we climb a long, steep uphill to follow the mainroad which goes more or less straight through the middle of the island to the capital Castro. 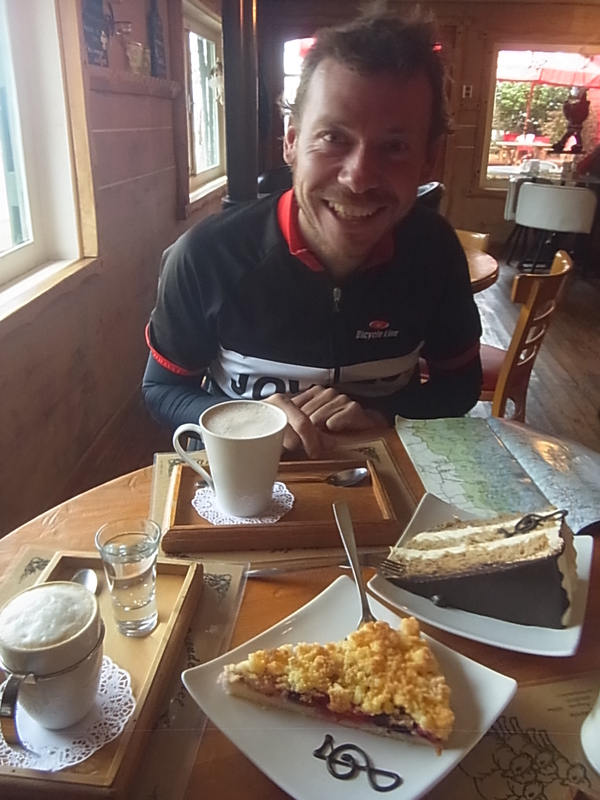 The rain stops when we change direction and we have a long wide view to both sides of the road but cyclingˋs still no fun. This road is the only North-South connection while all side-roads end at the few coastal villages of the island and so there is a lot of traffic. At least the tourist season is over and the crowds who outnumber the original population in summer by 2-3 times are gone but there is still an endless row of cars and trucks which pass by with enormous speed and noise. Itˋs not quite the idyllic island weˋve expected although the vegetation is rich and the view everchanging between the hills and valleys we cycle along. The second night brings another nice surprise. 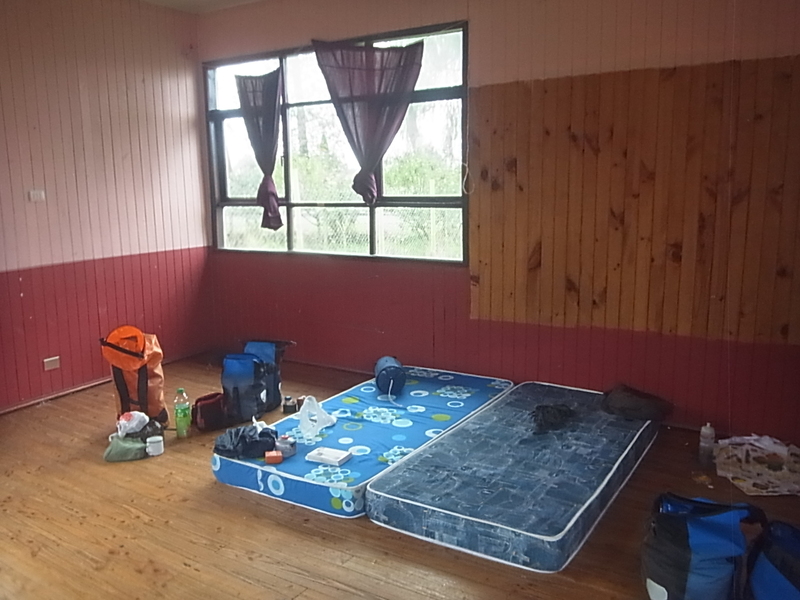 We get to about 25km before Castro, where we seek accomodation and are guided by locals to a woman who is responsible for the Sede Social, something like a community house, where we should be able to stay for the night. After having found the right house of the lady, she is not at home, but her husband offers us to stay in their old house for free. Of course we accept, the nights are chilly and humid and we never know if we get the chance to dry the tent during the day, so itˋs perfect just not to have to use it! More surprises then in Castro. 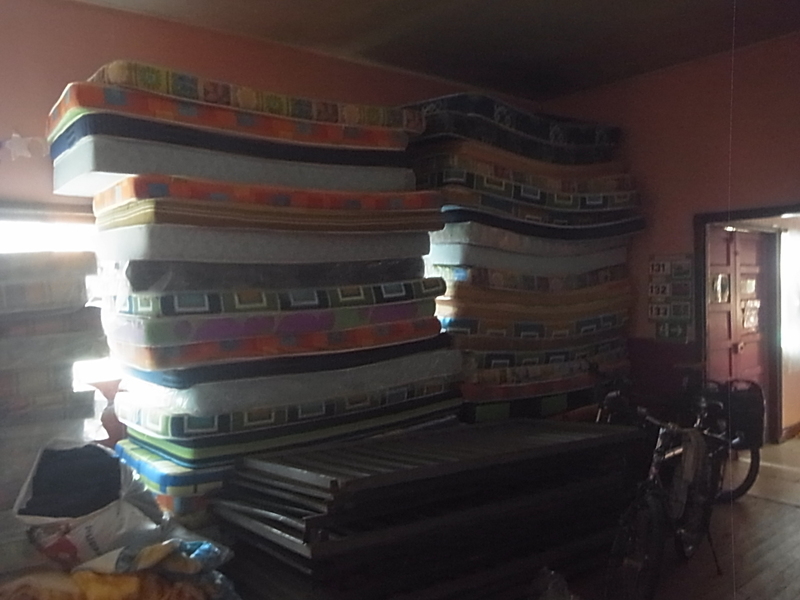 Like very often in touristic regions, there is no chance to find a place to sleep for free (like Bomberos, Sede Social) but we find a cheap Hostel at the costanera, across from the fish-market. 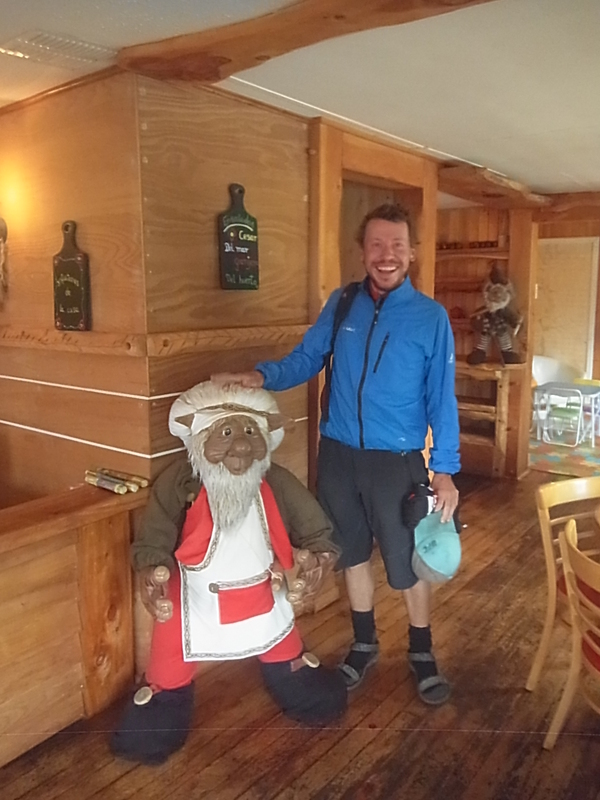 And at this market we meet Achmed again, a french guy we spent some time with on the boat through the patagonian Fjords. Nice coincidence and since itˋs also his birthday, heˋs is glad about our company and invites us for dinner. 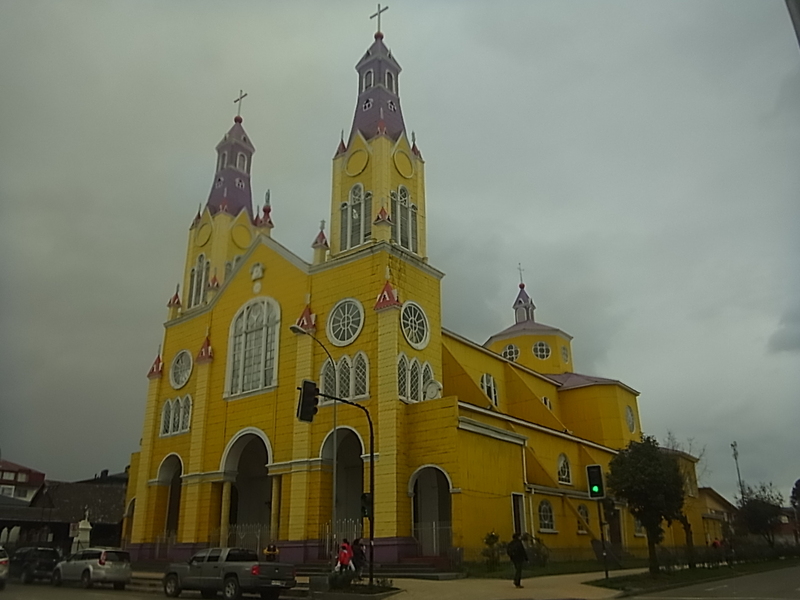 Till then we stroll through the city, visit of course the church (one of the 16 which are announced world heritage) and have a look at the ˋpalafitosˋ – beautiful colored wooden houses, built on wooden stakes at the seaside, so the inhabitants can get in and out during the flood by boat. And we dedicate a lot of time to food. Freshly harvested juicy corn, fruit salad, Ceviche and Pichanga (french fries with loads of meat, chorizos and longanizas). 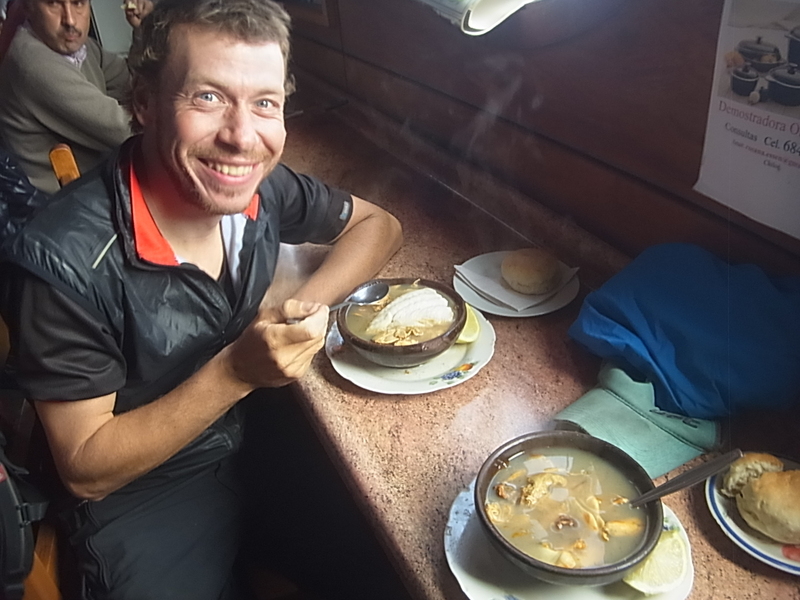 Followed by more seafood during dinner with Achmed where we have fresh fish and Paila Marina (soup of sea fruits – with huge mussels). Up to now there is one thing granted, the reputation of Chiloe for its food is justified and we are more than curious to try more of the local dishes, especially the Curanto: Different layers of mussels, chorizos, chicken and potatoes, cooked for hours inside a big earthhole on woodcoals. Doesnˋt that sound delicious? 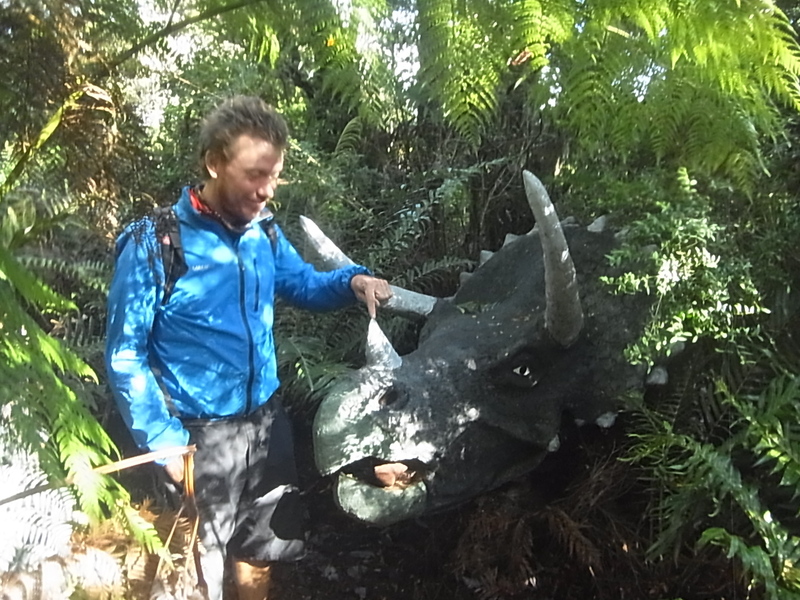 So we say good-bye to Achmed the following day and ride on in direction of Dalcahue, famous for the Curanto which is served every Sunday at the big fish-market. 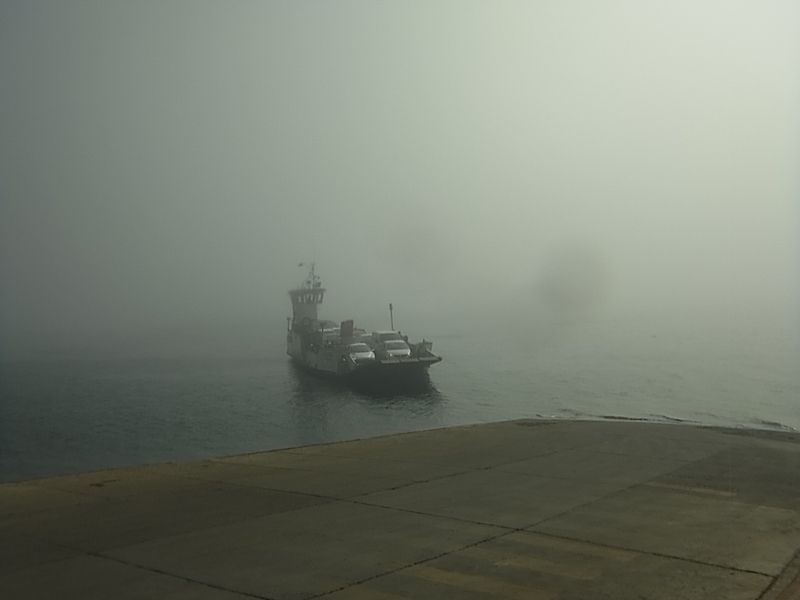 We have a little time to spare and make a detour for the island of Quintao. 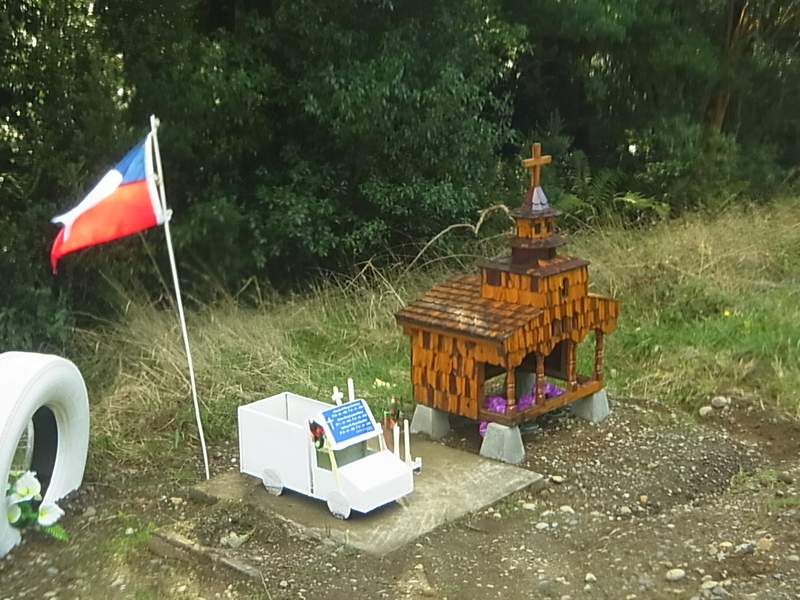 This is a really nice little island, quiet, with very steep hills, wonderful views down to the sea and more wooden churches in every village we pass. 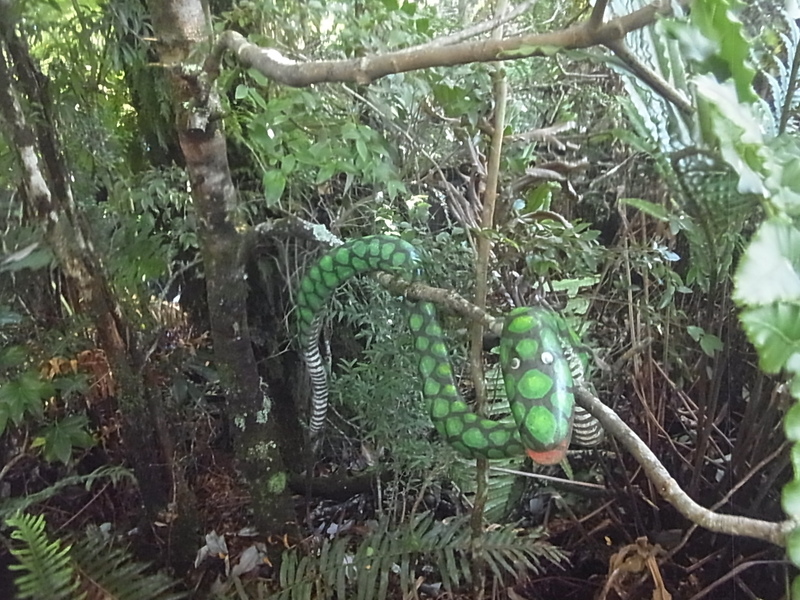 Shortly later the sun comes through, typical for the region and one of the reasons for the rich vegetation. 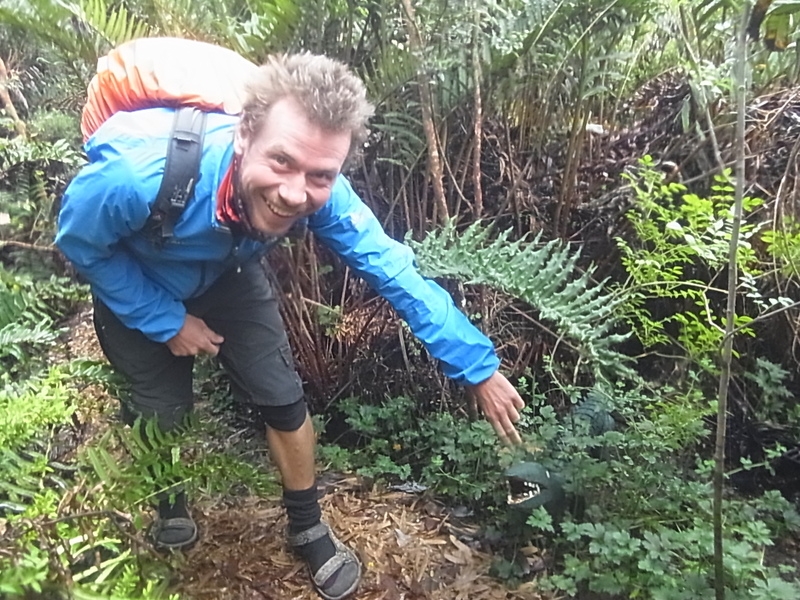 We arrive on Saturday in Dalcahue and get to stay in another Sede Social, although the man responsible does not seem 100% happy with this to us, but some of his co-workers sent us to him so he is caught in between a bit. 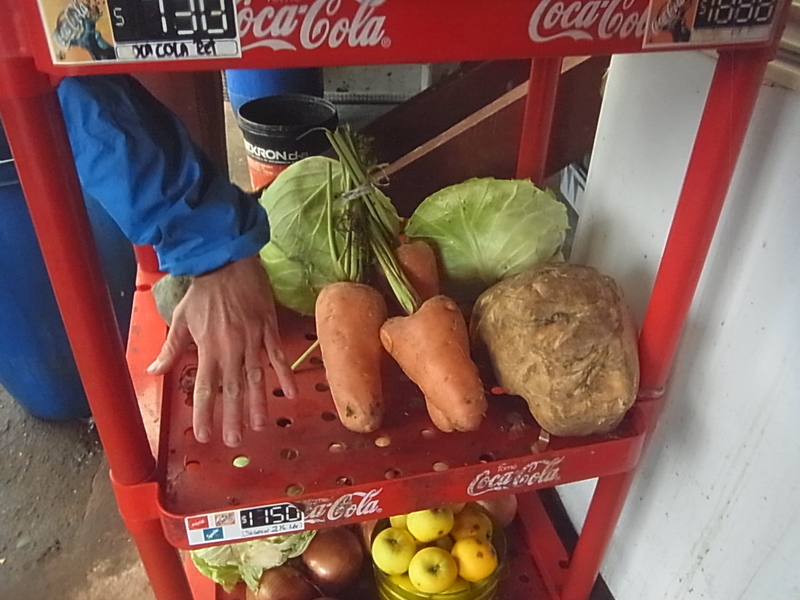 On Sunday it poors rain and we are out on the street, but the market is nothing worth seeing, maybe because the high season is over??? 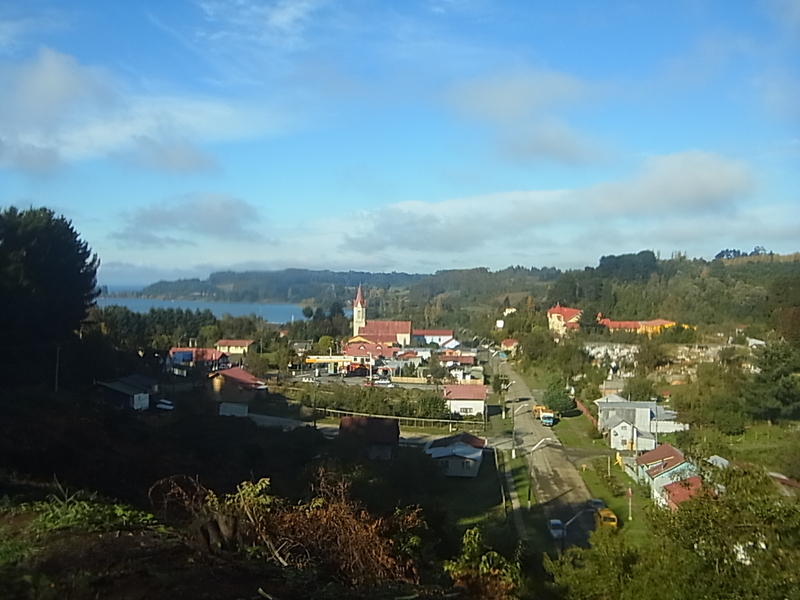 Then itˋs time to leave Chiloe. 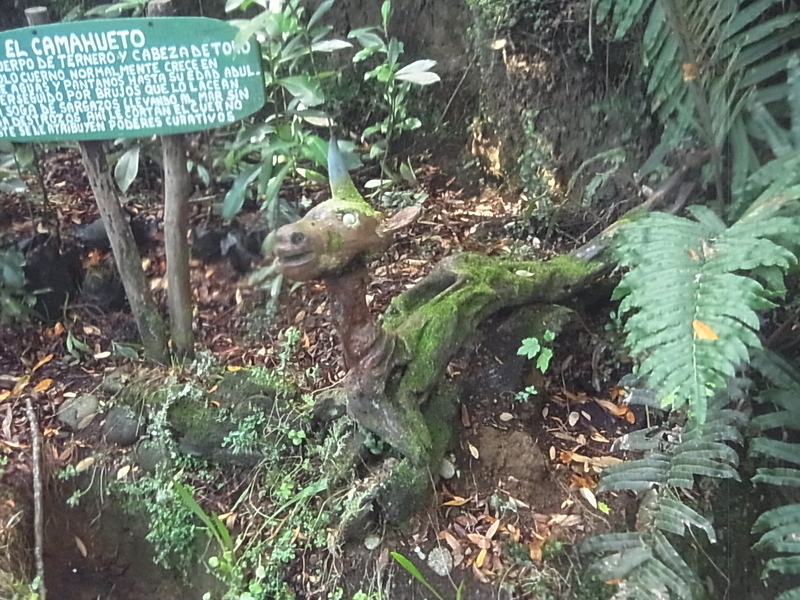 Due to all the rain we canˋt use any of the unpaved side-roads to visit more places so we head back to the same mainroad we came on and just stop for a visit of the Parque Mitologico. 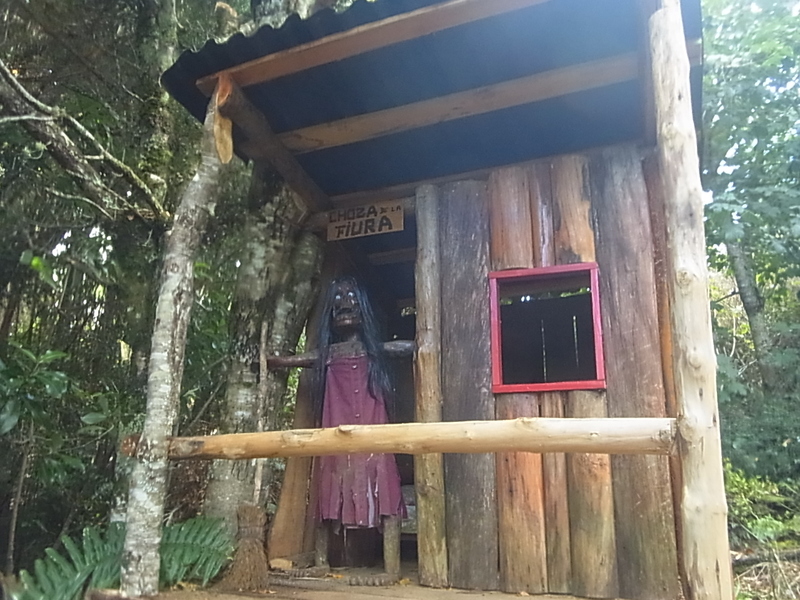 The visit consists of a 30min walk through a forest, in which all the mythologies and legends of Chiloe are presented by wooden figures and some explanations. The majority circles around witches and ghosts and creatures living in the dark and robbing single women and everything is really well made, with love for details and all in all itˋs a funny way to learn some local culture.